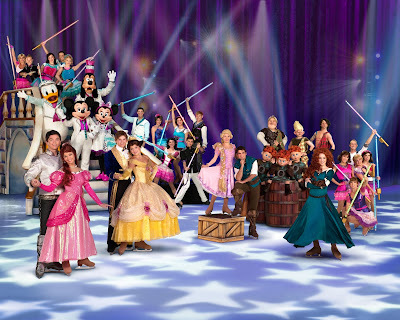 A Beautiful Ruckus: Disney on Ice presents Rockin' Ever After! Giveaway! Disney on Ice presents Rockin' Ever After! Giveaway! Okay, okay, you can call me a kid. But I'm totally excited about an upcoming show at the Sprint Center! is coming to Kansas City, March 27th-31st! "Get ready to rock out with some of the most magical idols of all in a musical showcase that features the hottest tunes and talent from across the kingdom in Disney On Ice presents Rockin’ Ever After! Jam to a Scottish jig as a group of royal contenders from the latest Disney•Pixar film, Brave, competes to win the heart of headstrong, sharp-shooting Merida, making her ice debut! Experience a show-stopping performance as Sebastian breaks out of his shell for one night only to make waves with Ariel. A chorus of harmless hooligans from Tangled unleashes musical mayhem when they get a visit from the sassy and spirited Rapunzel and her charming ally Flynn. And, get your feet moving as the Beast and his castle’s enchanted entourage take center stage in a spectacular show for Belle. It will be a rockin’ remix of royalty when Disney On Ice brings this superstar line-up to your hometown!" Ah, Disney! Since we have been married, Sean and I have been collecting the Disney classics as they've come out of the vault. I've never seen Disney on Ice before, but I'm excited to see some of my favorite characters, such as The Little Mermaid and Belle, come to life! The big question I have is whether they will have Sleeping Beauty on skates too?? What's even more exciting (or maybe equally exciting, because I'm pretty stoked) is that four tickets to this show are going to one of my A Beautiful Ruckus readers! Four tickets! You can definitely make this a family event! All you have to do is enter through the Rafflecopter widget below and then watch your email to see if you win. I hope you do! And if you want to make sure that tickets don't sell out, you can purchase them through this link HERE, use the promo code BLOG and get $5 off your tickets (excluding opening night and not valid on front row, rinkside, VIP, or kid seats). If you are certain you want to go, I wouldn't wait too much longer. I'd hate for the seats you want to be sold out. Several sections already are! The contest ends at 11:59pm on Tuesday, March 12th. The winner will be announced and contacted by email on Wednesday, March 13th. The winner will have 48 hours to respond to the email with their information so that the prize can be forwarded to them. A Beautiful Ruckus is not responsible for the delivery of the prize and is not responsible if the sponsor does not deliver. This giveaway is open to residents of the United States. A Beautiful Ruckus received complimentary item(s) for review in exchange for hosting this giveaway from Feld Entertainment. For more info, please see my disclaimer page. The ultimate fairy tale princess...Cinderella! I love Mulan. Girls kicking booty and taken names! We collect all the old Disney's too! So fun! My all time fav is Belle. *gasp! * Me too!!! I dressed up in her ball gown...I even had the gloves! I always loved Mickey Mouse! He's just so cute! Lori S.
I am a fan of Rapunzel in Tangled! Jill L.
Belle because she is a bookworm just like me! Ariel for sure, she is so beautiful! And I love the music in her movie. I think I enjoy the Disney movies more than the kids! Ariel has been my favorite since The Little Mermaid came out when I was 10! Saw it in the theater 3 times! Can this Princess only enter once a day? It let me share the giveaway on my facebook but that was all? Mickey! He was my favorite growing up and now he is my sons (which I love to see). I love all of the princesses!! I loved Belle. I remember seeing it in the theater...which was a big deal. Recently enjoyed watching it with my girls! Cinderella is my daughters favorite. Although recently Tinkerbell is giving her a run for her money! I love belle and my daughter loves cinderella! Ariel because she was so spunky!